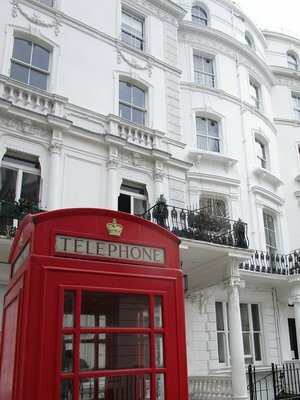 I love England!! Everyone is so nice, and after spending 7 months in Asia, there’s definitely something to be said for being able to understand what people are saying again. After a very long and uncomfortable flight from Thailand and 2+ hours standing in the immigration line at Heathrow, you’d think I’d immediately crash out at my hotel near Hyde Park, but you would, of course, be wrong. I couldn’t wait to take my poor broken body on a 3+ mile walk around the neighborhood and the park. 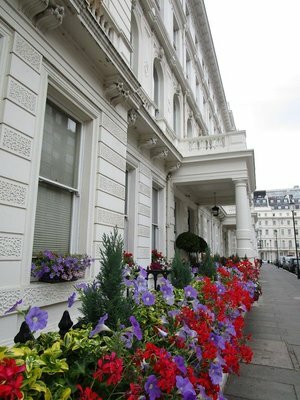 The architecture is so beautiful and the entire country is in bloom with colorful flowers. 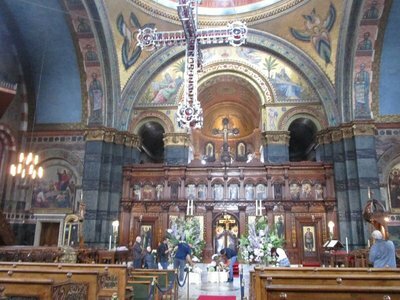 I passed by St. Sophia's, a Greek Orthodox cathedral built in the 1800s, and was peaking inside when a tiny old lady dressed all in black invited me in to take some flowers from the alter display they were dismantling- how lovely!! 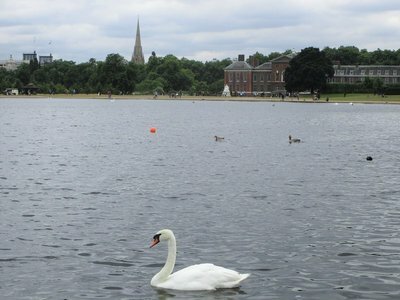 Classic Hyde Park: Swan, Kensington Palace and statue of Queen Victoria. 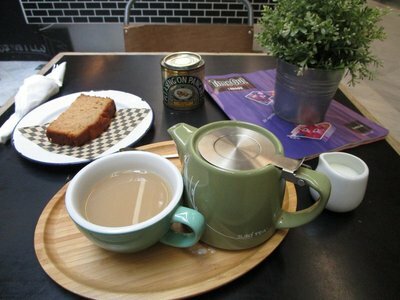 I found a tea shop nearby and had my first cup of English tea. I don’t know what kind of magic they use to make tea over here, but it’s ever so delicious! I By the time I finally dragged myself back to the hotel I looked and felt like an extra for the Walking Dead. 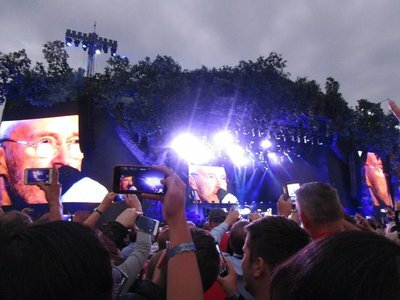 The reason I ended up in London was to see Phil Collins at a big festival in Hyde Park. I had my eticket on my phone, a raincoat, a sweater and a sun hat to prepare for the ever changing weather and since it was such a nice day, walked the mile or so to the venue. When I tried to get in, I found I had no cell service and the ticket wouldn't load - I ended up an a no man's land between the bag search area and the ticket gate- the festival staff were so nice and we eventually found an old email on my phone verifying the purchase and they let me in- Whew! I immediately went to the cider stand and had the first of many of these delicious beverages I would enjoy on this trip. 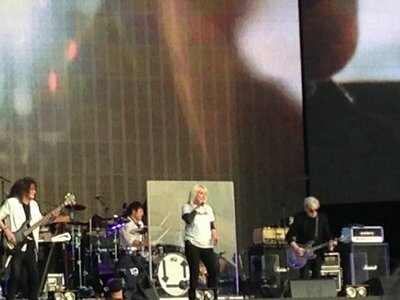 Blondie opened for Phil Collins and she was freaking awesome! I had forgotten how many of her old songs I liked and the new stuff was really excellent as well. If she ever comes to a venue near you , GO! The concert was standing only and by the time Phil Collins came on we were packed in closer than sardines, balancing on top of about 10,000 beer cans and wine bottles; I couldn't help but think about the soccer stampedes here that crushed people. I also thought it was odd that, other than a few teen aged event staff, there was NO security- not a cop in sight. 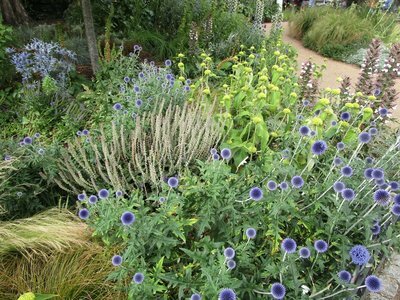 I was really surprised, as the Manchester concert bombing had occurred only a couple weeks prior so I expected to see police everywhere. Anyway, Phil Collins was great! His voice isn't exactly perfect any more but the band was phenomenal. When they did "In the Air Tonight" I was completely blown away- I'd go back any day just to hear that again- it was just amazing. Also, his son is now the drummer for the band- he's a real cutie and it was so cool to see him performing with his dad. Leaving the concert was an interesting experience. At least half the people were literally falling down drunk and a few were having screaming fights. Keeping in mind that everyone was pretty much over 40, I was a bit taken aback. The next day I went down to beautiful Soho where every building is more interesting than the next. Then I wandered down to the National Gallery and was in heaven. I went on a short tour and although we only looked at 4 paintings, I couldn't get over how much there was to learn about each of them- the provenance, the historical significance, the symbolism, the type of paint, the colors, the styling, the artist, etc. - unbelievable! I want to go back to school and major in art history. 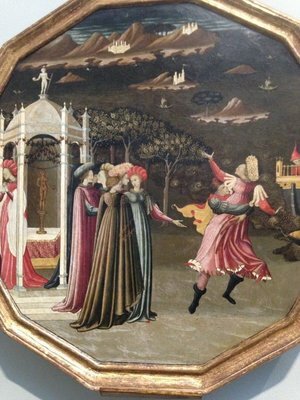 I loved the one below "The Abduction of Helen" circa 1440. Helen is literally being kidnapped by Paris, and her friends are all " Oh, Helen- so much drama- whatever". 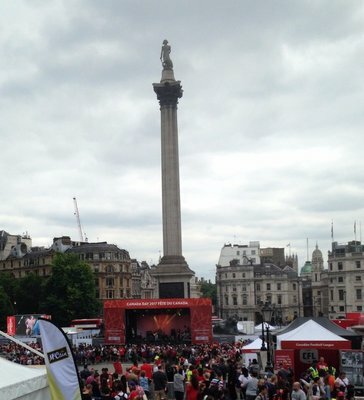 Trafalgar Square is right outside the National Gallery and it happened to be Canada Day- again, huge crowds, no cops. And if there is any doubt that the current US administration is viewed as a total laughingstock overseas, see below. 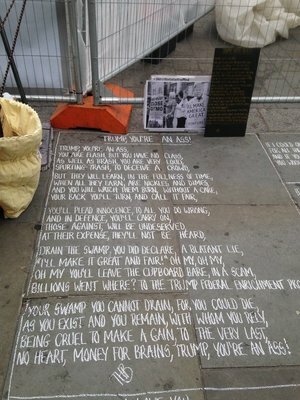 This sidewalk artist was raking in the cash. 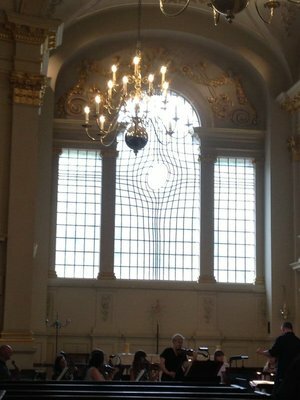 I also popped into a St Martins in the Field- there's been a church on this site since the 1200's and the unusual east window is from 2008. I was lucky enough to hear a rehearsal of that night's classical concert- great acoustics in these old buildings! That night I saw "Bat Out of Hell" at the London Coliseum. 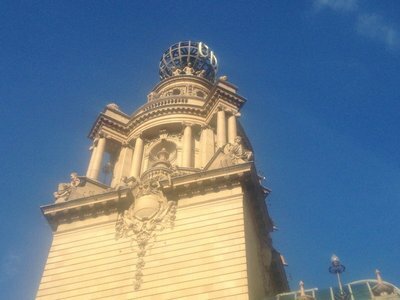 Apparently, since this is also the home of the English National Opera, there was some controversy about it being an appropriate venue for a rock and roll musical- tut tut. The show was so much fun- it was a bit of a stretch to build a plot around the 3 albums and the lead singer was no Meat Loaf, but I loved it! 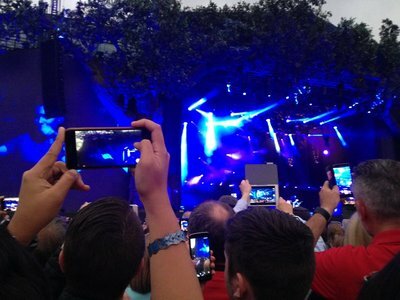 How come I can remember every word of those songs 20 years later, but I can't remember where I put my phone 5 minutes ago?! There's so much to see and do in London- I'll be in the city a few more times during the next couple of months and I'll still only be scratching the surface. Next on the agenda, Brighton!